Turkmenistan's capital, Ashgabat, is transforming itself into a shiny, white-marbled metropolis. Drab, Soviet blocks make way for gleaming new buildings with golden domes. Construction continues apace 24 hours a day 7 days a week. 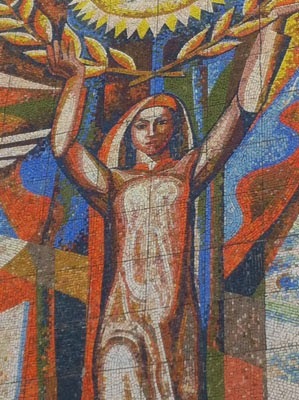 Yet here and there in Ashgabat, as well as some spots in the provinces, are marvellous examples of mosaics from the Soviet period. Following the devastating Ashgabat earthquake of 1948, in which 110,000 people reportedly were killed, concrete buildings were hastily constructed. In the 1970s, however, artists turned their attention to these buildings. 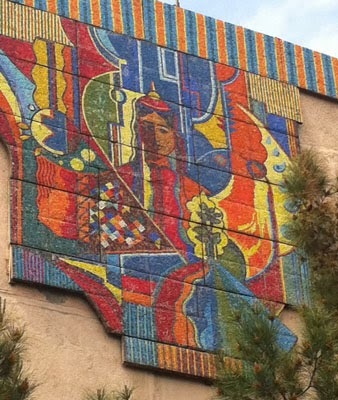 They started to decorate them with mosaic panels in combination with ceramics created by Turkmen monumental painters Alexander Shchetinin and Artyk Ramazanov. 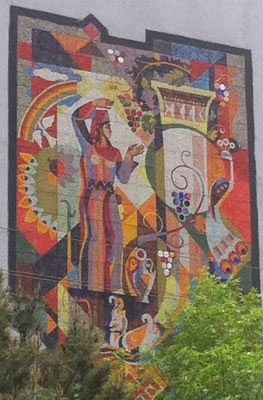 Then later with the works by young muralists, including graduates of the Tashkent Theatre and Arts Institute. 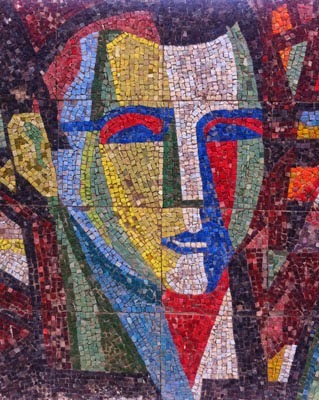 One such artist was People's Artist of Turkmenistan Muhammetmurad Gochmuradov, who designed a mosaic novel The Beauty of Art that decorated a row of residential building facades. (See image further down). 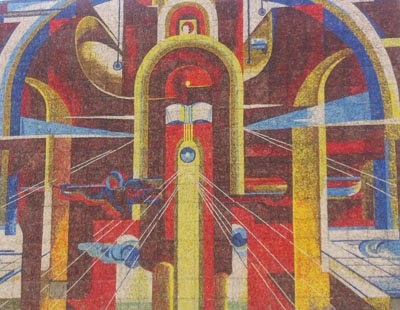 According to art historian Maral Kadzharova, Gochmuradov attributed his mosaics to his passion for Mexican muralists Diego Rivera, David Alfaro Siqueiros and Gabriel Orozco. Gochmuradov was born into a family of shepherds in Akhal province and tended small camel herds - his first canvas was the desert sand. The Mexican style and the aesthetic influence of his native, Turkmen landscape produced some remarkable pieces. 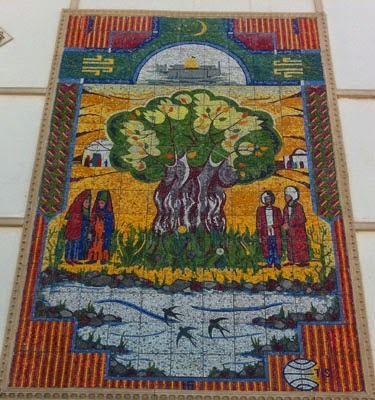 Ashgabat's mosaics also celebrate workers, heroes, musicians or the harvest. But there are few, and their future is uncertain. Like the mosaics of Uzbekistan, I hope that someone will document Turkmenistan's splendid architectural panels before it is too late. Below are examples of pieces I captured during a recent visit, sometimes snapped from a moving vehicle.